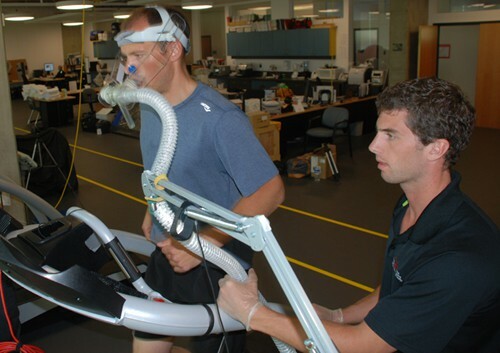 If you have ever researched running potential much, chances are that you have run across the VO2 max test. 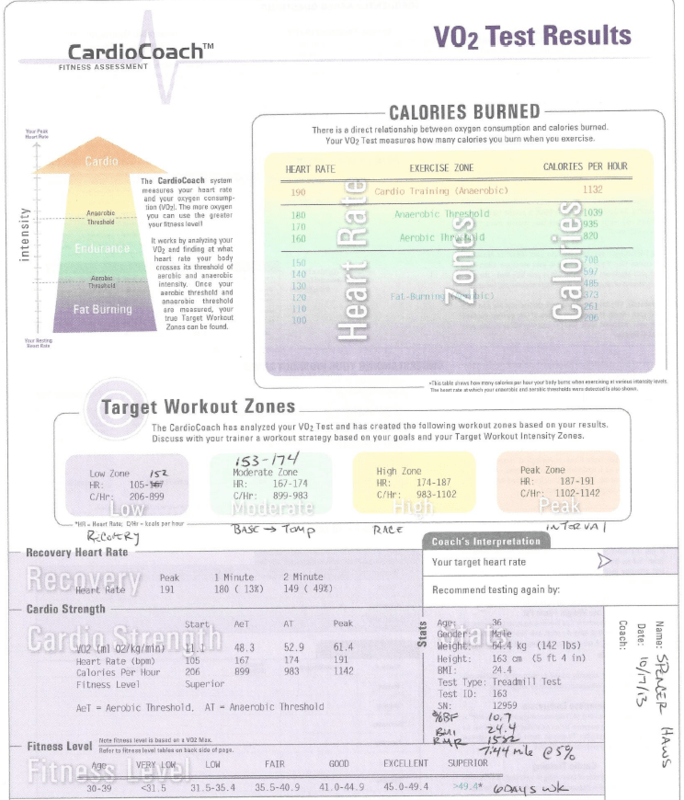 In fact, we’ve even written a couple of articles right here on RunnersGoal.com including how to improve your V02 max. After reading so much about this test and how it can be one of the best predictors of overall endurance ability, I wanted to officially get my own VO2 max tested. And so I did! Yep, earlier this month, I went to a local physical therapy place that I had heard not only would conduct the test, but they would also perform a a running gait analysis. I think just as important as the results of the test, I wanted to share my reasons for why I got a VO2max test in the first place. Mostly its because I’ve played a mental exercise with myself over the years as to whether or not I have any natural ability for distance running. You see I never ran more than a mile until I was probably 21 years old. Distance running was not something that I gravitated towards when I was younger at all. And when we ran the mile in gym class I would say I was just slightly above average, but never anywhere near the lead pack. So, what was I “naturally” good at when I was younger? Well, turns out I was a natural runner, but sprinting was my forte. In addition, over the years I often get told that I look like a wrestler or a gymnast. Both are true. So, I always performed quite well in sports that were suited towards someone that was very quick, fast, and powerful. As a boy, I was usually one of the fastest sprinters on the playground, I was a gymnast for a few years, and I excelled quite well at wrestling during my high school years. I also played baseball and any other sports where my quickness and speed could be utilized. But again, I was never much of a long endurance type person. I had fast twitch muscles, but never really tried out those slow twitch muscles until the last few years. Maybe you’ve had similar self-doubts as you train for distance running. So, I wanted to get the VO2 max test to give me some insight into what my naturally endurance ability really is. To settle the debate going on in my head of whether or not I should really keep pursuing this whole distance running thing. I was fully going into the test expecting that I would be at a very average level. I walked into the Therapeutic Associates office, and met Aaron who would be performing the test. Because they have all the fancy equipment, the test itself is a fairly simple process. However, for me, the runner…its pretty difficult! First, Aaron, an Exercise Physiologist performing the test, had me hop on the treadmill for a few minutes at a real slow pace just to warm up. He had also got me wearing a heart rate monitor as well. Give a sign that you can only run for 1 more minute before you’ve maxed out and need to walk. As you can see, its a pretty intense test! And remember, you have to wear a funky darth vader type mask that makes it a little more awkward to run and breath than normal. Well, I started off at about a 7:30 pace. I think I was already working too hard after a few minutes, so Aaron slowed me down to a 7:40 or 7:45 for the rest of the way. As I went, I just tried to focus on running normally even though I had the oxygen mask over my nose and mouth. Well, the test just got harder and harder each time the 1% incline came along. After about 11 minutes, I indicated that I only had about 60 seconds left in me. So I was at a 5% incline for that last minute where I just gutted out what I had left. Then I was able to stop, and the test was over. The results only took as long as the machine needed to print out the piece of paper. So, the result? My VO2 max is a 61.4. I vaguely knew that this was a decent number, but I really didn’t know where that fit in with the average population. 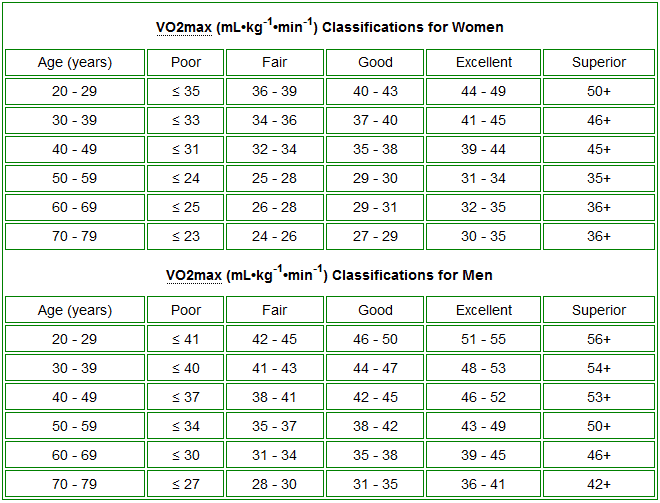 Here’s one chart that shows ranges of VO2max based on gender and age (there are many others that vary slightly). Turns out 61 is well into the superior range for a 36 year old male. Cool! V. H. Heyward, Advanced Fitness Assessment and Exercise Prescription, Fifth Edition, 2006, Champaign, IL: Human Kinetics. Original Source: The Cooper Institute for Aerobics Research, The Physical Fitness Specialist Manual. Dallas, TX. 2005. However, before you get to thinking I really “born” to be a distance runner, I should point out a couple of things. First, the highest recorded VO2 max ranges are in the mid 80s and 90s…significantly higher than mine. 97.5 Oskar Svendsen Cycling 18 year old from Lillehammer, Norway. The test was conducted in Sept 2012 at the University College of Lillehammer by physiologist Joar Hansen. So, these are the extreme cases, the freakish athletes with more tools (VO2max) than any of us could ever hope for. I’m FAR from being in this category. Also, I was informed by Aaron, that its not uncommon for him to see VO2 max results in the low 70s for some of the high school cross country team members that come in. So, what does all of this mean for me? Well, basically it means that I do indeed have a bit higher innate ability for endurance sports that the average person. However, it also means that there still several more superior level of athletes with even more innate ability that I do for VO2max. But, as its turns out, VO2max is only one part of the equation, and perhaps not even the biggest indicator for performing well in distance running. While VO2max can loosely seen as an overall cap, the anaerobic threshold and heart rate recovery are much more important indicators of overall ability to run at high speed over a long distance. And as it turns out, Anaerobic threshold and heart rate recovery are more easily improved through training that VO2max can be improved. Practice can go a long way in this department! Here’s some quick stats on my Aerobic threshold, Anaerobic threshold, and heart rate recovery. Peak – 191 BPM (heart rate), 61.4 VO2 at this point (max). Heart rate after 1 minute – 180 (13% decline from max). I could go into a lot more detail about the importance of your anaerobic threshold, but I will simply say its critical to your success. Basically, VO2max tells you how big your gas tank is, while Anaerobic threshold tells you how much gas you are actually putting in the tank. So, people with a lower VO2max can still outperform people with higher VO2maxes if they improve their Anaerobic threshold. So, I could improve my overall endurance and speed by training more near my Anaerobic threshold of 174 beats per minute. As I train more at this threshold, my body will become more and more efficient and I should be able to reach higher speeds for longer distances before my heart rate reaches 174 BPM. As Aaron explained (this person performing my test), if I haven’t been using a heart rate monitor to train (which I haven’t), I could make huge improvements rather quickly in training my heart to perform well at this ever important anaerobic threshold. Secondly, my heart rate recovery was terrible. After resting for 1 minute, my heart rate had come down from its max by only 13%. This should have been closer where I was after 2 minutes (149 BPM). Again, this is something that I can apparently make huge improvements on by performing more intervals and hill workouts (mostly). Improving this heart rate recovery time will help me perform at a higher level over a longer period of time, and then obviously recover much quicker. But that’s not all, turns out that not only could I improve my Anaerobic threshold and heart rate recovery, but I could also make big improvements with my running form. 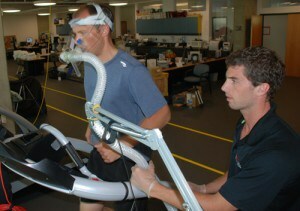 While Aaron was performing my VO2max test, he took the chance for a few minutes to actually record my running gate. Apparently I have terrible form! Actually, I already knew my running form was not that great, because I’ve seen enough running photos of myself! Well, after watching the videos of myself, frame by frame, it became pretty obvious what I was doing. My primary problem is that I strike the ground with my foot out front of the rest of my body with a straight leg. What I should be doing is striking the ground underneath my body (basically a straight line from head to foot) and my legs should be slightly bent when they strike. He showed my this video as an example of Ryan Hall with great running form. I also happen to be a heal striker, which isn’t actually that big of deal, but a mid-foot or fore-foot strike would be more ideal. The bigger problem though is definitely the foot striking in front of my body with a straight leg. How do I fix my running form? Well, the fascinating thing is that the therapist had me take my shoes off and with just a couple of pointers, my form was suddenly pretty good! With my shoes off, my feet were striking where they should be (underneath me) with legs bent, and I was no longer striking my heals as much. So, should I run barefoot now? No, that’s not the recommendation…but trying out a pair of shoes with a lower toe to heal drop, more minimalist would be a good idea. Apparently I am relying big time on the cushion of my shoes, which is causing me to run improperly and clearly unnaturally. I can also improve my running form through strength training exercises. Overall, my form is bad, but this can be fixed through strength training, practicing good form, and perhaps training with different shoes. As I improve my form, this can give me a huge boost in conserving energy as I run more efficiently. Bottom line, improving my running form will help me run faster for longer distances without getting as tired. One of the primary training recommendations that I was given based on these results, was to start training with a heart rate monitor. As I train properly in certain heart rate zones, rather than training at a speed that may or may not be correct, I should be able to improve my Anaerobic threshold level and my heart rate recovery time. Overall, its recommended that I work more on interval training, hills, running in the right heart rate zones, and additional strength training. 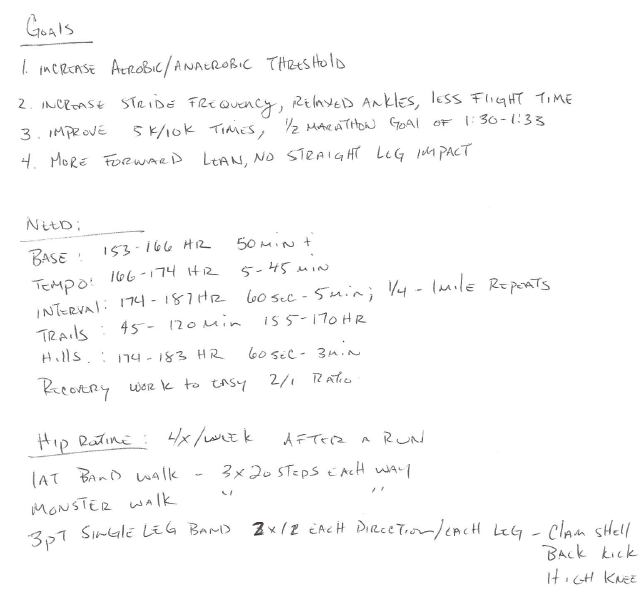 Here’s an image showing the hand written training recommendations based on my test results. 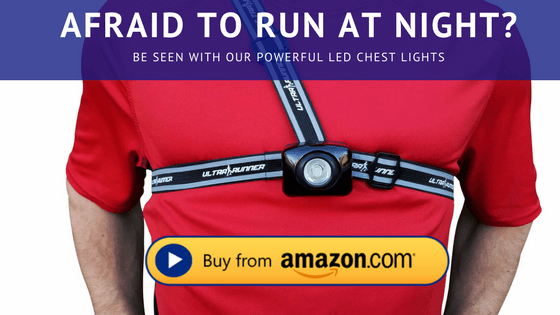 Training with a heart rate monitor is going to be a big change for me, but I’m going to give it a shot because the potential results could be huge. So what is my potential based on my VO2max test? According to Aaron, he believes that I could be running a half marathon in a time of 1:30 to 1:33…that would be almost 10 minutes over my current PR! (1:39:40). I was absolutely blown away when the Physiologist thought with confidence that I could be running that time in a half. I asked him how much time he thought it would take me to achieve that goal, and he said ONLY 4 to 6 months! To give you an idea, I trained for about a year, and only improved my half marathon time by about 1 minute and my full marathon time by 5 minutes. So, to say that I could drop my time by almost 10 minutes in half a year is absolutely mind blowing to me. However, I’m going to give it a shot with all the new data that I have about myself. I will keep everyone posted of course! So, overall I really enjoyed seeing the results from my VO2max test. Turns out that I do have at least a little bit of natural ability in the endurance running event. I’m far from the top level athletes out there, but I’m also still well above average with a VO2max of 61.4. But what I didn’t realize going into the test, that there are other areas that I can control that can have a bigger impact on my running performance in a shorter period of time. In particular, as I train with a heart rate monitor and focus on improving my Anaerobic threshold, heart rate recovery, and running form, I should be able to drop quite a bit of time in my races. And who knows, maybe I can even get close to the 1:33:00 time in a half marathon in the next 6 months. The stats say my body is capable of doing it, the natural ability is there. Now its just up to my time and dedication to make it happen. I would love to hear your thoughts or comments below. If you have anything that you would like to add to the discussion below, jump in below and let me know! Have to ask what is your half marathon, 5k 10k pb now did you have any improvement or did you stick to the HR training?? I only stuck with the HR training for a short period; but it was enough time for me to set a PR in the 5k. I will likely go back to HR training when I start training a bit harder.